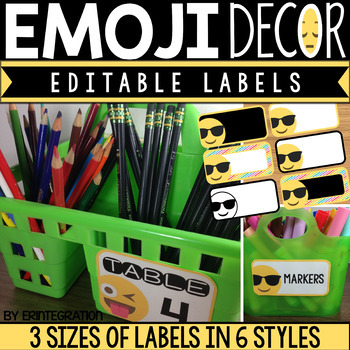 Emoji labels - 3 sizes and 6 designs. Decide which set works best for you! 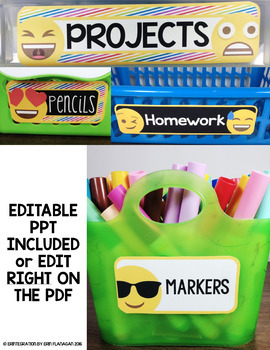 Each set uses 24 different Emojis for plenty of variety. 3 label sizes to choose from measuring approximately 2.5x10 inches, 4x5 inches and 2.5x5 inches. Different printers may print slightly different sizes - maybe off by up to an inch. You can also adjust your printer settings to print smaller. All labels are editable RIGHT in the PDF or use your own fonts on the included PowerPoint files. 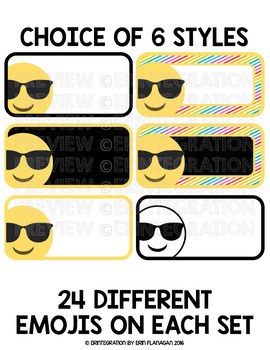 Also includes blackline set of all labels too! ★ EDITABLE PPT PowerPoint files - one file for each style for 84 total slides. ★ 89 page EDITABLE PDF includes directions. Just click, type and print what you need.